On Monday, January 23, IES El Palo presented the project: "Future Skills and Sustainable Development in Hairdressing Salons" at IES Isidoro Sánchez. 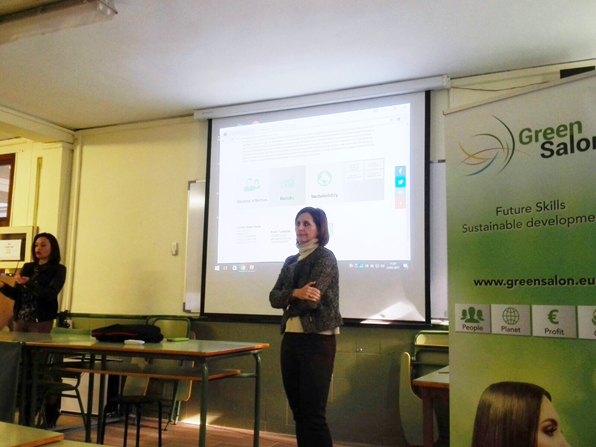 Both schools are the only ones in the capital that offer professional studies of Personal Image and therefore it was imperative to share with their students and teachers the objectives and results of this European project also known as "Green Salons". One of the tools created within the Project was a questionnaire or scanner to know the situation of hairdressing salons and schools in the participating countries, regarding safety,health and environmental protection. After performing the scanner in some of the most prestigious hairdressing salons in Malaga, it was time to be tested in an educational center, and accordingly, we asked our colleagues from IES Isidoro Sánchez who kindly accepted our invitation. For several hours, a total of 34 hairdressing students and 7 teachers worked in groups analyzing aspects as diverse as the toxicity of some ingredients of cosmetics, gloves and other prevention measures, recycling the waste generated and how to reduce the high consumption of water and energy in a hairdressing salon. The students showed a great interest in the topics discussed and this encourages us to continue working and researching for a more sustainable hairdressing. In the following months our aim is to test the scanner in other VET Schools of the province of Malaga.